It's a pretty cloudy night here in NYC, but I did get some nice looks at tonight's Super Moon, Harvest Moon, Fourth In A Tetrad Lunar Eclipse. It was about here before a big cloud discouraged me and sent me back inside to fold laundry for a while; fortunately when I was done I decided to go back out and at that point it was fully eclipsed, deep red, and then one last look outside just now let me see the moon coming out from the other side of the shadow. Glad the clouds cooperated as much as they did and glad I gave getting a shot a shot - wasn't sure I would get anything but using a parked SUV (fortunately not one of those vehicles with the hair-trigger alarm) to steady the camera worked pretty well. Norwegian Sea Stories and Bluegrass in Red Hook, Thursday, 9/24 - NOW FREE! 9/23 a.m. update - Carolina just contacted me and asked me to add that the concert is now FREE! Not sure what angel made this happen, and please do still register through Eventbrite (link further down), but - it's free! Donations to PortSide NewYork can still be made at the door or on their website, it's a good organization to support. Helloooooo again from the usual September work madness! Got a backlog of things I want to post about but I'm gonna skip over those right now in favor of a quick lunch-hour sharing of a press release from my friend Carolina over at PortSide NewYork. They're hosting a terrific-sounding event featuring the NYC premier of Norwegian bluegrass Paradise Mountain Boys, who are generously donating this concert to support the organization, on Thursday night - sorry I didn't give a little more notice! Tickets $15 on sale Event is FREE, please register at Eventbrite. Love bluegrass? History buff? 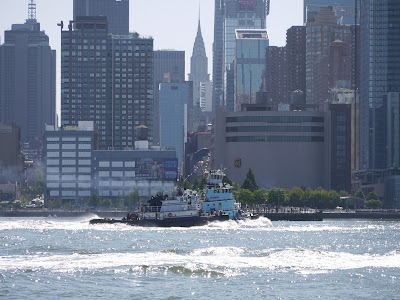 Interested in New York City’s waterfront? PortSide NewYork has combined it all in one special night for you! Nestle in a sofa or dance into the night at the NYC premiere of the great bluegrass band Paradise Mountain Boys from Norway - and get yourself a NY WaterStory! Produced by PortSide NewYork as part of our ongoing Red Hook WaterStories. Norwegians were one of the major immigrant groups in Brooklyn from the late 19th to early 20th century. 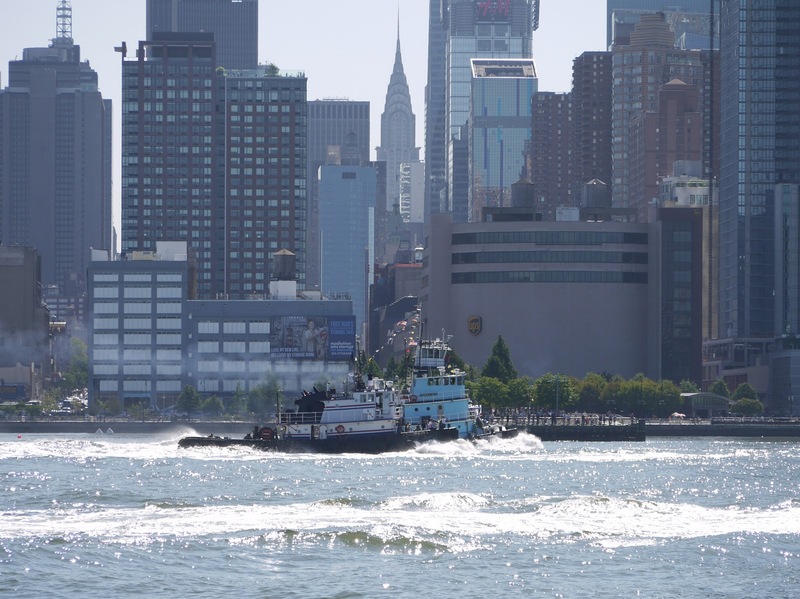 They were a major presence on NYC's working waterfront and on our historic ship, the tanker MARY A. WHALEN. They were first concentrated in Red Hook, Brooklyn. At their peak, there were almost as many Norwegians in Red Hook as there are residents in Red Hook today. Hear about the first people to row across the Atlantic, Norwegians in 1896! And how Norwegian seaman stranded in here toughed it out in a Red Hook shanty town until Robert Moses cleared it out. and how Norwegians were a major presence on our historic ship the Mary A. Whalen . BIO OF BAND PARADISE MOUNTAIN BOYS This is the NYC premier of the Paradise Mountain Boys! The band plays bluegrass the traditional way with all the band members around one microphone. Their six-piece acoustic outfit of mandolin, dobro, banjo, guitar and upright bass has its roots firmly planted in down-home acoustic music found in the Appalachian mountains. Traditional bluegrass and bluegrass gospel, with beautiful harmony singing is their thing. 7:00-7:45pm Ordering of food from local establishments (optional but there's some good food in Red Hook! ), followed by three short history talks with slides. Speakers Lars Nilsen of the Norwegian Immigrant Association, Victor Samuelsen of the Norwegian Seaman’s Church, John Weaver of PortSide NewYork. Ha ha ha. "Cheerybabble resumes tomorrow", she said on Sunday, completely forgetting about how work gets in the middle of September, ha ha ha. So I'll just change the order a little bit here and put Sunday of Labor Day Weekend first instead of going in date order. I went through my photos last night and put them up in a Flickr album - didn't caption yet but it's basically the race, the bow-to-bow pushing, the last competitor in the line toss contest, and then the spinach eating contests - didn't get much of the kids but Mandy and I had front-row seats for the adults and as usual, it wasn't pretty, but it was tons of fun! Album ends with a dog ready for the mascot contest and a sailboat enjoying the quieting river. Click here to visit the album. Terrific work as always by the Working Harbor Committee. Missed Capt. John Doswell but I know he would've been glad to see all of us out there having another great day celebrating the working boats of NY Harbor. Happy Sunday! I'd planned to go back to my usual kayak cheerybabble today with a trip report from an unfancy but very nice solo paddle in J-Bay I went for on the 5th, but then I saw Tweezerman's comment on my 9/11 post. He mentioned the Boatlift video; I love that video, I loved what the maritime community did that day, and I'm so glad that I was able to play even the small role in those efforts that I did, helping out with the lines when Pier 63's John Krevey called some of the party boat captains who sometimes used his barge as a loading point for parties and offered the barge as an evacuation point. Being able to actually help people was such a good balance for the fearfulness of my underground morning flight from the WTC. 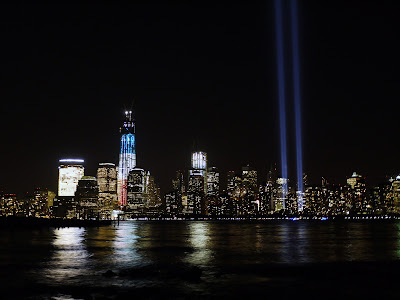 Photo taken from Liberty State Park in Jersey City, 9/11/2012. Remembering of course. We all have stories from the day; here's mine. Well, ugh, September's going like a runaway train as usual and then some (more on the "and then some" when I'm good and ready and a little less swamped). I had a fabulous Labor Day weekend, hope yours was good too. I had a paddle and a swim and a tugboat race, there are a gazillion pix from the tugboat race that I just haven't had a chance to go through, so in the meantime, hey, how about another afternoon on Oahu? Day 4 still, so woulda been Tuesday afternoon. I'd had a nice morning hike, I had a belly full of teri steak burger Buzz's style, which means basically a bunful of marinated, kiawe-wood-smoked steak (don't anybody clue them in about how usually "burger" means ground beef, OK?). I had wheels, I had some money, I had snorkel gear, and I didn't have to be anywhere at any particular time, so the afternoon was just free to flow the way it flowed - any trip should have some time like that, right? Ended up being a lovely smorgasbord of an afternoon - little of this, little of that, little of t'other. I started with a stop at Lanikai Beach, reputed to be one of the most beautiful in the world. I'd heard snorkeling was pretty good here, so I'd decided to come check it out. It is pretty, isn't it? And the sand is maybe the softest, finest sand I've ever felt anywhere. Mmm. The problem with beautiful fine sand like this is that it doesn't take much wind and wave action to stir it up into the water. Beautiful beach, nice coral, good numbers of fish but visibility just wasn't good. Fortunately this one honu decided to swim close enough for me to see, but after he went on his way, I decided to hele on. I left Kailua and headed for the North Shore, picking up the Kamehameha Highway in Kaneohe. First stop was at He'eia State Park. I'd actually stopped here with thoughts of more snorkeling, Kaneohe Bay is good for that. Didn't find a promising place to get into the water (didn't look too hard though) but I was excited to see the He'eia Fishpond. This is a HUGE traditional Hawaiian fishpond that got taken over by invasive mangroves after the walls were breached in a flood in 1965, but it's been largely restored through the efforts of the not-for-profit group Paepae o He'eia and a whole lot of local volunteers. I had actually hoped to come volunteer here during my visit, I thought that would be a really fun, interesting, and maybe even moderately useful way to spend a morning, but they weren't having a work day while I was here. I made a small donation instead but I was delighted to stumble across it in my unplanned ramblings. Also enjoyed seeing this shed sheltering traditional wooden canoes in various stages of construction. Next stop was a totally unplanned one, just to grab a quick photo of the Hygienic Store. Then, back on the road. For all of about twenty seconds, at which time I spied a sign on the side of this truck that proclaimed "HULI HULI CHICKEN". Remember when I was talking about the kiawe tree and how the wood is the key to the flavor of the classic island fundraiser, huli huli chicken? Well, huli huli chicken really is mostly sold as a fundraiser, so to get the real thing you have to find a school or a church that's doing it, which I hadn't done this time. BTW, if you're wondering about the name, "Huli" is Hawaiian for "flip over" (yes, when your canoe capsizes, it hulis). When an organization does a sale, the huli huli chicken company comes in with giant grills that are filled with kiawe wood and enough chicken for all the chickens people have ordered in advance plus extras for drive-ups drawn in by the smoke. The marinated chickens are put into these big frames with handles to cook, and when the cooks are ready to flip them, they yell, "Huli!". Hence, huli huli chicken! I was delighted to find a roadside stand selling the stuff. Chicken and kalua pig plate with two scoop rice and mac salad (woohoo!). Onolicious! I gave the chicken some rice. Chicken would've been weird. Heading onward once again. Sun was getting low in the sky as I arrived at Shark's Cove in Pupukea, but there were still people out so I decided to join them. Third time will have to be the charm for a really good snorkel here, this time the light wasn't going to last for long and last time I'd locked my car keys in the trunk, which actually turned out to be lucky because otherwise I would've fried 'em in the drybag fanny pack that turned out not to be dry (this time I had a proper waterproof case that fit in the non-dry drybag nicely and that worked great) but it also meant not as much time as I would've liked. This is a lovely snorkel spot in the summertime (wintertime this is all big crashing waves). Sea urchin - had to be really careful coming out later 'cause these guys are everywhere and it was getting pretty dark, but I made it ok.
four-spot butterflyfish, oh I really do have to make a proper visit here next time I come! NOT THAT GUY AGAIN! This was actually a joke shot for Tane - when we'd gone to Hanauma Bay I was really shocked to see some guy snorkeling around with one of these ridiculous things - and then I was in hysterics 'cause he turned out to have ZERO sense of spatial awareness and somehow for a minute or two, wherever Tane tried to swim, da buggah was just always in her way. So I absolutely cracked up AGAIN when this guy is lining up the perfect selfie with sunset at Shark's Cove, so I took this and posted it on Tane's wall that night with the caption "Guess who was at Pupukea today!". Not the same guy but still funny. And here's the sunset without selfie-stick guy. Prettier this way, yeah? Farewell to Shark's Cove. I will be back! After this it was dark so I decided to head on back to Lulu's place, bypassing Haleiwa. And by the time I got back to Kapahulu Avenue I discovered I had enough room for one malasada. I posted this shot on facebook with the caption "Malasada Moon" - click the photo to see the moon better! Lulu had warned me that Leonard's has gotten wildly popular and there's always a line. Wasn't too bad this night though and I had my malasada (and a mini pao doce for later consumption) pretty soon. Malasadaaaaaaah! And that was the end of another great day. Tuesday the 28th of July, I'd left pretty open. I was up pretty early (I'm not a morning person at ALL here in NYC, but since most of what I wanted to do on O'ahu was outdoors and required daylight, I took advantage of the time change that had me up much earlier than I usually am) and was out the door shortly after 8. First stop was at Snorkel Bob's on Kapahulu Avenue for mask, fins, and snorkel. I wasn't entirely sure of the whole day's plan yet but was I was pretty sure that there would be some snorkeling, probably at Lanikai Beach, which is by some accounts supposed to be the world's most beautiful beach. First activity of the day ended up being a short hike on the Old Pali Road. This was kind of on a whim, I hadn't really thought of it until I was coming up on the offramp for the Pali Lookout, but this is another really nice short hike. I haven't really done it justice, treating it as a sort of a nice spur-of-the-moment addition to a day's activities, there are actually a couple of waterfall trails you can get to from the Old Pali Road if you give it a little more time, but once again, it's good to have something to look forward to on another trip trip. As it was, I just followed the old highway down to the new highway and turned around there instead of finding the ladder you use to get under the new highway and continue. It's another really nice easy trail, following the old highway as it does, and very lush and green and jungly, with sweet-smelling ginger to stop and sniff along the way. View from the Pali Lookout, looking out towards Kaneohe. As usual, click on any photo for a better view! View from the Lookout, looking at the knife-edged cliffs. Plaque honoring the 50th anniversary of the old Pali Road, which opened in 1898. Ignore the "Road closed" and "You shall certainly die from rocks falling on your head if you are foolhardy enough to pass this point" to get to the Old Pali Road trail. Go to sleep, sleeping grass! Lauhala. This tree's fronds are great for weaving; I actually had a lot of fun getting to try my hand at this myself later in the trip. Octopus tree flowers. Wish I'd taken a picture of the entire growth that gives the tree its name - these branches covered with the flowerets grow in splayed multiple clusters, looking like octopuses reaching their arms out from the leaves. Looking down at the tunnel that now takes drivers under the Pali. Having worked up a nice appetite hiking, my next stop was Buzz's Kailua for lunch. The only actual tropical drink of my entire trip, mainly chosen in honor of a co-worker who'd told me to drink a foofy drink for her. Special mai tai with pineapple juice - pretty yummy! And what I really came for - kiawe wood grilled teriyaki burger, only somehow the chefs at Buzz's labor under the misapprehension that a "burger" is chunks of delicious tender steak on a bun. And I hope nobody ever tells them otherwise! And now I needed to take a little time for the mai tai to wear off before I get back behind the wheel, so I walked over to Kailua Beach Park. Ama like a bird - wonder if it makes the canoe fly? Hibiscus - and that's it! Next up - first honu encounter of the trip!